VANCOUVER -- Beatrice Janyk credits vitamins, 12 hours of sleep a day and a busy mind for allowing her to donate blood regularly for most of the last 70 years. At 95, Canadian Blood Services says Janyk is the country's oldest blood donor. The great-grandmother and Coquitlam, B.C., resident has been donating blood since the late 1940s and says she has no plans to stop. "You betcha, 'till I'm 100. 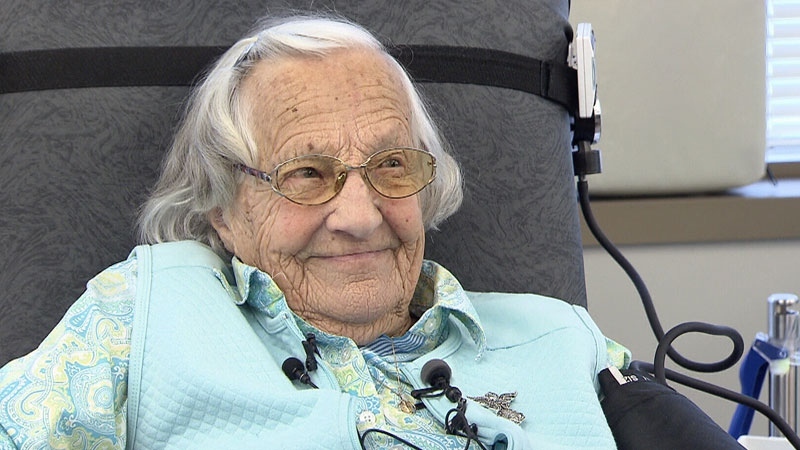 I'll be 96 in August," Janyk told reporters Wednesday before donating blood at a Canadian Blood Services centre in Vancouver, where she was recognized as Canada's oldest blood donor. 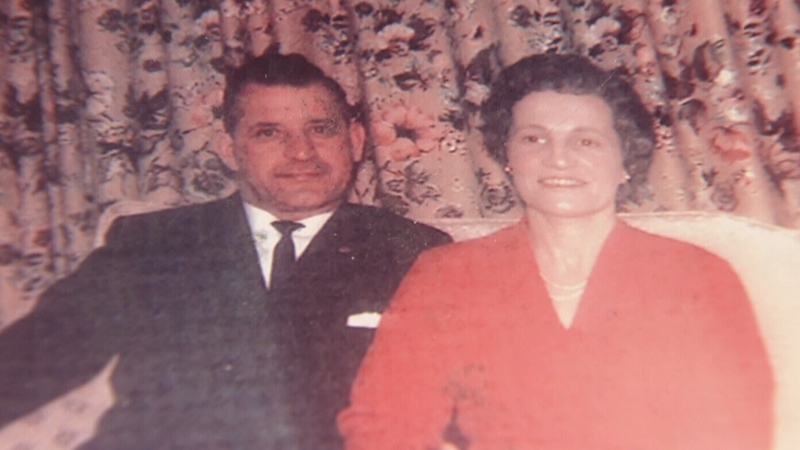 Janyk has advocated for blood donation since her now-deceased husband Bill was injured in a sawmill accident in 1948 and nearly died from a hepatitis infection he later contracted from contaminated blood. Though she was forced to stop donating blood at age 71 in Canada due to an age restriction, Janyk continued in 2005 after it was lifted. When she could no longer donate blood in Canada, Janyk rolled up her sleeve at the Bloodworks offices in Bellingham, Wash., and was awarded a celebratory pin for donating 20 gallons of blood. 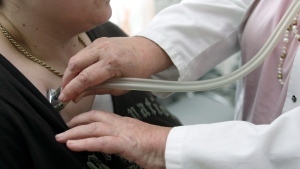 Canadian Blood Services says that's the equivalent of 170 donations in Canada. Janyk, whose blood type is O-positive, says she takes no medications so her blood can be used for children and infant transfusions, adding that makes her incredibly proud. "I hope I've saved a baby, because I take no medication, but (take) seven vitamins every night." Canadian Blood Services spokesman Marcelo Dominguez says Janyk is a paragon of the agency. "It is an example we hope others will want to follow," he said, as Janyk's family surrounded her. "We're all very lucky to have you. It's the perfect time for our organization to say thank you to a donor like you, who has been giving blood and saving lives for decades." Janyk says her secret to youth and happiness is going to bed early, getting up early, and keeping busy throughout the day. An avid cribbage player, Janyk says she doesn't take naps and tries to keep busy with crochet, needlepoint and making rosaries. Janyk says her proudest achievement is the family she's created. Her son Barry Janyk, a former mayor of Gibsons, B.C., spoke glowingly of his mother. "I don't know why, but I think we're more proud of her, because all I can say is if I was 95 and still giving blood, I think that's an accomplishment in anybody's world." Along with her sons Barry, Robert, and Bill, Janyk was joined by her grandson Garrett, and granddaughter Britt Janyk, who skied with the Canadian Olympic team. The great-grandmother's message to anyone afraid to give is simple: "No pain, 20 minutes, then you'll gain." Granny 'Bea' Janyk smiles as she donates blood Thursday, April 18, 2018. Granny 'Bea' Janyk has been donating blood since her husband was injured and given tainted blood in the 1940s.